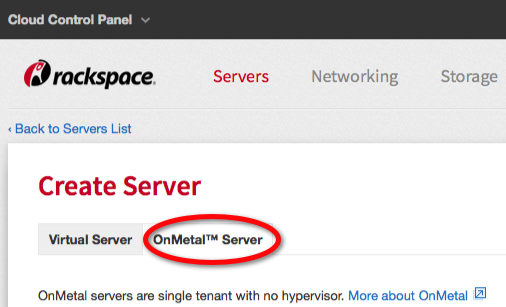 To create your server as an OnMetal™ server, open the OnMetal™ Server tab on the Create Server page of the Cloud Control Panel. Click the OnMetal Server tab to begin creating an OnMetal server. OnMetal I/O is optimized for large relational databases, noSQL data stores,and Online Transaction Processing (OLTP) applications. OnMetal I/O servers are designed to support low-latency and extreme throughput to local storage, using a pair of the fastest PCIe flash cards available. OnMetal Memory is optimized for large-scale caches, index searches, and in-memory analytics. OnMetal Memory servers are designed for memory-intensive workloads such as Memcached and Redis. 512 GB servers and a low-latency 10 GB/s network enable modern architectures with the entire working set in RAM. OnMetal Compute is optimized for high-traffic web servers, application servers, load balancers, and queue processing. OnMetal Compute servers are designed for connection handling and CPU-heavy workloads such as web serving. With high speeds, plenty of cores and a low-latency 10 GB/s network, OnMetal Compute is perfect for rendering web pages or pushing packets.